Can Drinking a Lot of Water Give You a Headache? Drinking too much water can cause you to experience headaches as a symptom of hyponatremia -- that is, low sodium concentration levels in your blood. You may have eaten enough salt, but if you drink too much water without increasing your sodium intake, the imbalance is enough to cause health problems. Sodium is required for maintaining blood pressure and the functioning of your nerves, muscles and other organs. The reduction of salt concentration in your blood affects the size of cells in organs throughout your body. These cells grow when the salt concentration is low. A low salt concentration means that your brain actually grows in size within your skull, and the pressure is what causes a headache. In fact, the compression of the brain against the skull can cause brain impairment that affects regular bodily functions -- even breathing. It goes without saying that drinking too much water can be very dangerous. Besides headaches, other symptoms of hyponatremia include fatigue and weakness, nausea and vomiting, loss of appetite, restlessness, irritability and confusion. You can find out whether you're experiencing hyponatremia by getting a blood or urine test. Simply restricting your water intake can reverse hyponatremia, but a doctor may recommend medication to treat the headache or restore balance in the body through an IV. Hyponatremia can occur if you drink a lot of water during long, intense exercise but do not replace electrolytes. Drinking sports drinks containing electrolytes can help prevent hyponatremia and the headaches that arise from it. If you have to use the bathroom more than once every two hours and your urine is clear, it's an indication that you may need to drink a little less. If you still feel the need to drink, have a drink that contains electrolytes to help your body stay balanced. Dehydration from not drinking enough water can cause headaches, too. To make sure you're getting the right amount of water, divide your weight in pounds by half, which is the number of ounces of water you need daily. For example, if you weigh 150 pounds, you need 75 ounces of water daily, which is about 9 cups of water. If you're an athlete, you need to drink about two-thirds of your body weight in ounces each day. 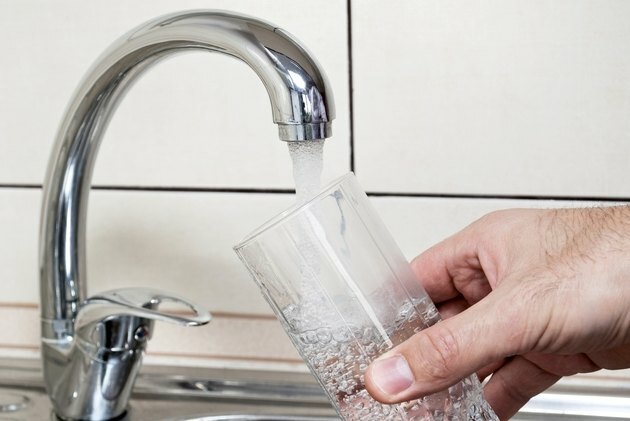 BBC News: Why is Too Much Water Dangerous? Can Too Much Sodium in My Diet Cause Headaches? What Should I Drink if I'm Thirsty?